THE ULTIMATE WINE AERATOR - The Omni Wine Aerator opens up wine bouquet, softens tannins, and creates a smoother mouthfeel to enhance your overall wine drinking experience, all in the short time it takes to pour a glass. The Omni is the best and last wine aerator you will ever own. Treat yourself and your wine right with the Omni Wine Aerator. RELIABLE AND TIME TESTED AERATION - The Omni Wine Aerator is the only aerator to use two PROVEN and time tested methods of aeration. The Omni combines aeration mechanisms of traditional decanter funnels and modern aerators to bring together the best of both worlds. No tricks, no gimmicks, just fine wine. INSPIRED HASSLE FREE DESIGN - Unlike other wine aerators, the Omni has no side holes or small pieces that can easily leak, break, or get lost. This means that the Omni is not only the most beautiful and effective wine aerator in existence, but also is one of the easiest to use, maintain, and clean. 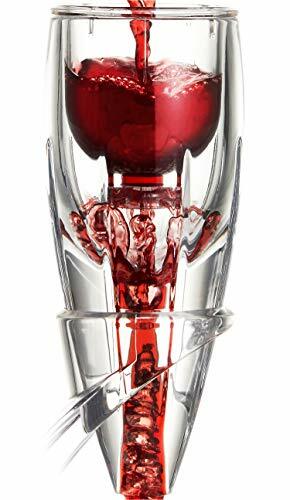 THE CENTERPIECE OF YOUR WINE COLLECTION - The Omni Wine Aerator is manufactured with 100% high quality FDA approved acrylic for durability and is presented in an impressive premium gift box packaging. Don't be surprised when your crystal clear Omni Aerator is mistaken for a trophy or an elegant dining table centerpiece.